Shop at Bodum, online at Bodum.com, the official store of Bodum cookware and kitchen gadgets and appliances. Bodum carries their top quality coffee brewers, espresso machines, tea brewers, thermoses and carafes, kettles, grinders, salt and pepper shakers, cutlery and knives, mugs and jugs, accessories, barbeques, grill tools, and more all in on stop. But before you shop, be sure to get all the latest Bodum.com discounts, Bodum promotions, and Bodum coupon codes found here at RetailSteal.com. 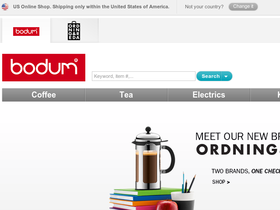 Bodum.com offers shipping within the US. Orders over $50 within the contiguous 48 United States have the option of free standard shipping. Orders to Alaska and Hawaii are delivered Fedex Express Saver or Fedex Express. See site for more information. Use this coupon code at Bodum and enjoy 10% off your purchase over $99. Plus get free shipping. Enjoy a $10 discount on your entire order from Bodum when you use this coupon code online. Use code on orders of $100+ to qualify. Orders over $50 delivered within the continental 48 United States are shipped for free. Click link to shop. Shop for Bodum coffee brewers from $17 at Bodum.com. Click here to enjoy. Bodum offers their selection of convenient and attractive tea presses starting from $20. Click here to shop.